Last year November my work was selected for exhibition in The London Group Open, which is a biannual event showcasing the work of current members alongside the same amount of works by selected contemporary artists. 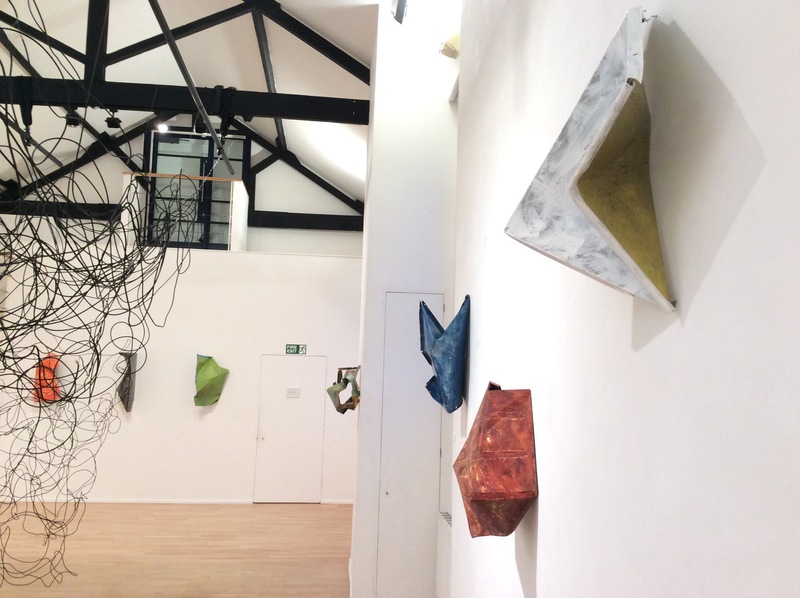 The membership is thriving, with around 90 members, so the show was spilt into two parts and hung in a salon style. The current main gallery used by the group is the Cello Factory on the Southbank. As the name suggests, it is a converted space with high beamed ceilings and skylights. The award of this space and the time to work in it meant that I was able to conceive a piece which is much larger than previous works. ‘Cloud’ is approx 4m x 4m x 3m and is suspended in the space, stopping before it reaches the floor. The salvaged wires are a mix of power, telephone and data cables, and have all been connected into one circuit here, with two tiny LED bulbs proving agency. This is an opportunity to experience a physical relationship to the copper cabling we are surrounded by and depend on for our life services, including communication, conversation, and data exchange. The material is unified by a small current, so the imagined past uses of the wires might bleed into one another, and have their current forms extended a little. They have been spared the scrap-mans’ smelter for now. I am also exhibiting 2D drawings for the first time, and I see those in terms of physical exploration too: Following my residency in Beijing I have been processing my experiences there in many different ways. One of the ways I have been trying to discover what this orange object is for is to draw it and draw it. No matter how closely I look I still cannot work out how it might be connected. They just stood on top of telegraph poles there as rare beacons of colour in the thick, flat air. Martin Heron takes his background in large scale public art installations as a starting point which he is able to position his work against at 180 degrees. In contrast to large heavy works designed to live an age, here he salvaged scrap metals and allowed them to have some say in how they are treated. 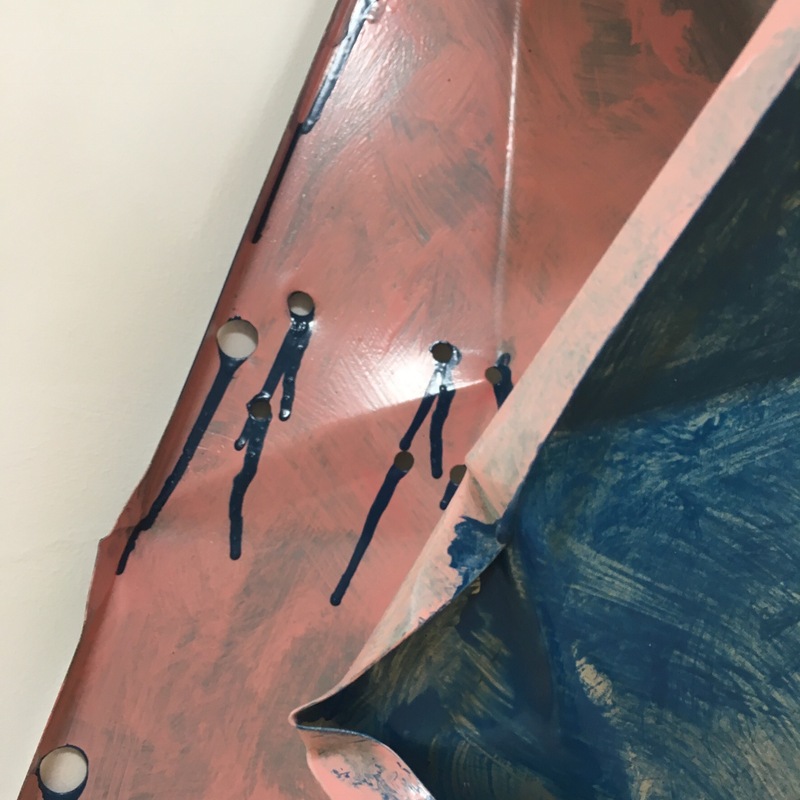 Martin manipulates his materials until they seem to have said ” stop!” They crease and fold according to previous marks, and colours in the form of paints and tapes respond to altered angles and lighting too. They protrude from the wall at intervals, giving an airy colourful illusion to their sharp edges. They are displayed at head height, which I feel places some of the responsibility for taking care back onto me, activating a personal interaction. Darren Nisbett is showing a photographic series chronicling his exploration of abandoned and derelict industrial machinery. 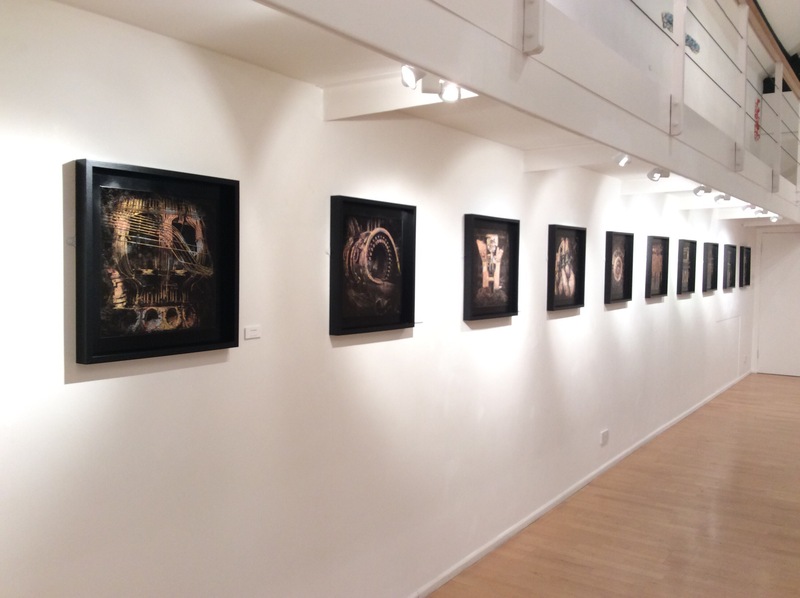 They are printed on guilted and textured metal, which transforms them into becoming relics themselves. They might be as decayed as their subjects. They are dark and imposing, mixing the mechanical with the possibility of the anatomical, and the scale of the original objects I hard to ascertain. 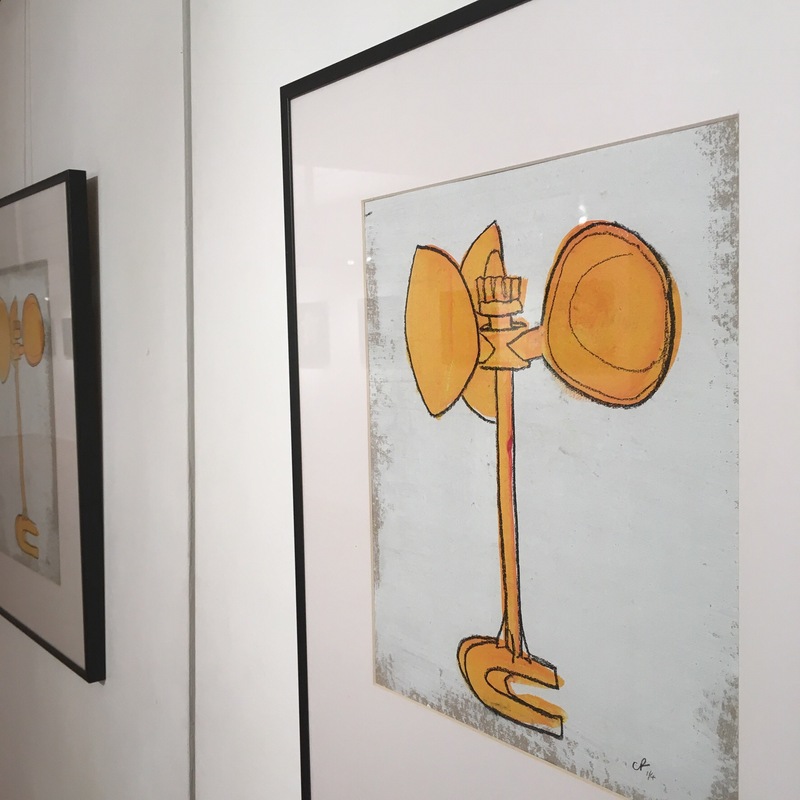 Small clues suggest their enormity, and the dark row of frames moving along the wall of the gallery seems to have a mechanical rhythm of its own. As a photographer Darren knew he would show on the wall, and as a space based sculptor I was keen to exploit the height of the space. Martin makes sculptures which are often displayed on the wall, so the balance was struck. I calculated logistics and materials before I arrived, but was not sure of the final form the work would take. This was dictated in part by how the cables I chose behaved on the day, and in part by how the space was transformed when the wall works were installed. As the rich dark photography and the colourful textured sculpture went up, it became clear to me that my cables should only be black, and the coloured and white wires of my collection were packed away. I began with the heavy, smoother cables, a mixture of data and telephone wires, which draped more elegantly in the heights between the beams. As I moved lower to the ground the work narrows, but still appeared to be floating upwards, and so the lower section is made from solid core power cable which is more capricious. I worked with the title in mind, as it was the only part of the making I could be sure of before I began. 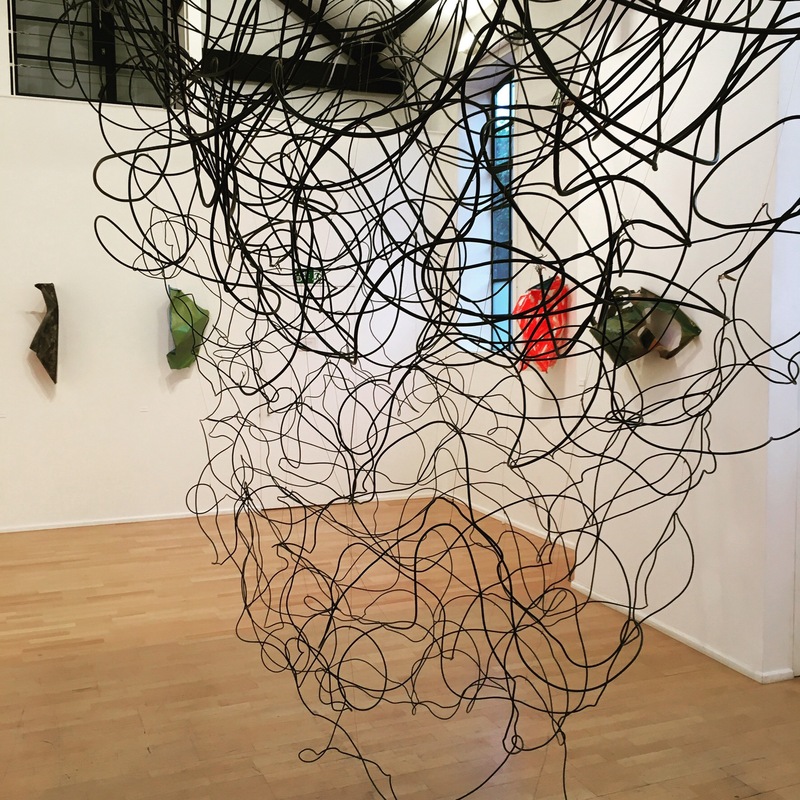 This is part of my explorations of the communication network and our interaction with it, and the hanging form gives a monumental presence to materials we customarily ignore or are insulated from. I also produced a publication to accompany the exhibition, with writing by Susan Haire, the president of The London Group. This was made by Risograph, which is a relatively analogue technique in the field of printing; kind of a mechanical screen printing process which uses vegetable inks, banana paper and large drums to reproduce the images. This gives a warm tactile print quality which is often slightly off-calibrated reminiscent of hand production. 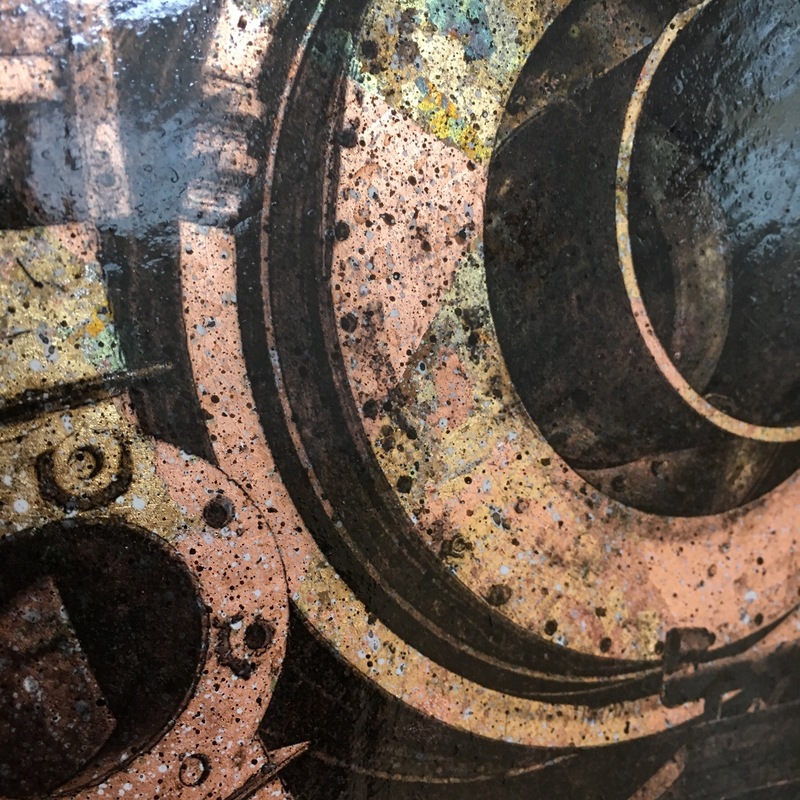 It seemed relevant to the materials and interests included in the publication is presented in a limited edition package which also contains three samples of metals, one produced by each artist in the show. These are available from the artists.